Ruins on the Brough of Birsay, once the seat of the early Norse jarls of Orkney. The Brough is now a tidal islet but in earlier times it was connected to Mainland Orkney by an isthmus. Rognvald Eysteinsson, Earl of Møre fl. 865–890 [a] is sometimes credited with being the founder of the jarldom. By implication the Orkneyinga saga identifies him as such for he is given "dominion" over Orkney and Shetland by King Harald Finehair, although there is no concrete suggestion he ever held the title. The Heimskringla states that his brother Sigurd was the first to formally hold the title. Sigurd's son Guthorm ruled for a year and died childless. Rognvald's son Hallad then inherited the title. However, unable to constrain Danish raids on Orkney, he gave up the earldom and returned to Norway, which "everyone thought was a huge joke". Torf-Einarr then succeeded in defeating the Danes and founded a dynasty which retained control of the islands for centuries after his death. Smyth (1984) concludes that the role of the brothers Eysteinsson lacks historical credibility and that Torf-Einarr “may be regarded as the first historical earl of Orkney”. Drawing on Adam of Bremen's assertion that Orkney was not conquered until the time of Harald Hardrada, who ruled Norway from 1043–66, Woolf (2007) speculates that Sigurd “the Stout” Hlodvirsson, Torf-Einarr’s great-grandson, may have been the first Earl of Orkney. Dates are largely conjectural, at least until his death recorded in 1014. One of the main sources for the lives and times of these earls is the Orkneyinga saga, which has been described as having "no parallel in the social and literary record of Scotland". One of the key events of the saga is the "martyrdom" of Earl Magnus Erlendsson, later Saint Magnus, c. 1115. The last quarter of the saga is taken up with a lengthy tale of Earl Rögnvald Kali Kolsson and Sweyn Asleifsson — indeed the oldest version ends with the latter's death in 1171. After the murder of Earl Jon Haraldsson some sixty years later, Magnus, son of Gille Brigte became the first of the Scottish earls. He may have been a descendent of Earl Rögnvald Kali Kolsson, although this has never been corroborated. However, the line of specifically Norse earls is said to have come to an end when Earl Magnus II was granted his title by Haakon IV of Norway c. 1236. Arnkel Torf-Einarsson Son of Torf-Einarr Rognvaldsson 910 Date of death based on the assumption Arnkel and Erlend Turf-Einarsson died at the Battle of Stainmore beside Eric Bloodaxe. Sumarlidi Sigurdsson Son of Sigurd Hlodvirsson 1014 "He died in his bed not long after his father's death" and is not referred to in an incident dated to 1018. After the close of the Jarls' Saga on the death of Jon Haraldsson in 1230, the history of Orkney is "plunged into a darkness which is illuminated by very few written sources". The first jarl known to have held the title after the Norse dynasty came to and end in 1230 was Magnus II but the title may have been held by an unknown other prior to his investiture. Although successive Jarls of Orkney were related, they each acquired the position by being personally appointed to the role by the Norwegian king; the Jarldom was not inheritable. ?Gilbert Possibly married to a niece of Magnus II, his existence is not certain. 1239 ? The lack of haste with which a new title was granted by the Norwegians to Orkney has led to the suggestion that Magnus Jonsson may have had an heir who was a minor, but who died before 1330. It is also likely that unravelling the genealogy of his potential successors and providing proofs of their descent was a time-consuming project. Whatever the reason, about a decade after Magnus's death the title was granted to Maol Íosa, Mormaer of Strathearn, a distant relative of Earl Gilbert. He ruled Orkney and Caithness from 1330 to 1350 and had several daughters, but no sons. The earldom was then left vacant for about three years,[i] following which Erengisle Suneson was a titular earl for a few years but when his right to the title lapsed prior to 1360 the jarldom lay vacant again. Haakon VI, the Norwegian king, had married the daughter of Valdemar IV, the King of Denmark. The sudden death of the Swedish king's rebel son, from plague, triggered the foreign policy obligations Haakon had to Valdemar, as a result of the marriage. These drew Haakon's attention away from Orkney, until the death of Valdemar, in 1375. In 1375, Haakon decided upon Alexander of Ard, the son of Maol Íosa's daughter Matilda and Weland of Ard (Aird, west of Inverness) as Suneson's successor. However, Alexander was merely appointed "Lieutenant, Captain and Keeper" of Orkney for a year on 30 June 1375. This was to be a probationary role, the intention being that if Haakon had been satisfied by Alexander's behaviour after a year, he would be appointed as jarl. However, Haakon did not do so, possibly because Alexander failed to deal with the violence that had become rife during the long absence of an earl's authority. In 1379, the jarldom was granted to another grandson of Maol Íosa, Henry Sinclair, by Haakon VI on 2 August 1379. Alexander of Ard Son of Maol Íosa's daughter Matilda and Weland of Ard. Appointed as "Lieutenant" only. 1375 1376? When James III of Scotland married Margaret of Denmark, her father, Christian I, king of Norway-Denmark, was unable to immediately provide a dowry. Instead, he promised that he would provide the dowry at a later date, and pledged the Norðreyjar as security for his promise. In 1470, James persuaded William to quitclaim his rights over Orkney and Shetland only, in return for lands in Fife; technically the Norðreyjar remained in existence as a Norwegian Jarldom, but William's authority became limited to the mainland parts, while Orkney and Sheltland became jarl-free. After a few years, it became clear that the dowry was unlikely ever to be paid, so in 1472, James declared the Norðreyjar to be forfeit (and forewent the dowry). As an immediate consequence, the diocese of Caithness was transferred from the Archdiocese of Niðaróss (Trondheim), in Norway, to that of St Andrews, in Scotland. The next Orkney title was the dukedom of Orkney, which was given to James Hepburn, 4th Earl of Bothwell, husband of Mary, Queen of Scots, in 1567. Later that year, however, he forfeited the title when Mary was forced to abdicate. The second earldom was created by James VI of Scotland. The Stewart earls were based at Kirkwall Castle, which had been built by Henry I Sinclair. It was demolished on the forfeiture of the title in 1614. The last creation of the earldom was in favour of the man who in 1735 would become the first Field Marshal of Great Britain, Lord George Hamilton, the fifth son of William Douglas, Duke of Hamilton. The peerage was created with "remainder to the heirs whatsoever of his body", meaning that the title can be passed on through both male and female lines. The title passed to the O'Brien family, then to the Fitzmaurice family, and later to the St John family. The subsidiary titles of Viscount of Kirkwall and Lord Dechmont were created at the same time as the earldom. None of these earls appear to have any connection with Orkney other than the honorific itself. The current earl, for example, was born and lives in Canada. Peter St John, 9th Earl of Orkney Third cousin of 8th Earl 1998 to date. The 9th Earl is the son of Frederick Oliver St John, son of Isabella Annie Fitzmaurice, daughter of James Terence Fitzmaurice, fifth son of the fifth Earl. The heir apparent is the present holder's son Oliver Robert St John (b. 1969), who holds the courtesy title, Viscount Kirkwall. ^ Assuming an identification of Rognvald with "Ragnall son of Albdann" in 865. ^ Anders Stølen has argued that Magnus Barelegs's mother was a daughter of "Ragnvald jarl" as stated in the genealogical text Sunnmørsættleggen who has in turn been identified as Rognvald Brusason (grandson of Sigurd Hlodvirsson) by Ola Kvalsund. ^ Muir (2008) suggests Sigurd Eysteinsson may have died c. 874. ^ Muir (2005) has a death date for Thorfinn of 976, which leaves only four years for three subsequent earls to rule before his son Hlodvir. ^ Muir (2005) dates the meeting of Ljot's brother Skuli with Malcolm II to 978. Subsequent to that Skuli and "Earl MacBeth" fought two battles with Ljot. Skuli was killed in the first, Ljot in the second. Canmore states that the battle at Skitten Mire where Ljot Thorfinnsson was mortally wounded took place "between 943 and 945" although this does not square with either Muir (2005) or Earl Thorfinn (his father) dying c. 963. ^ Woolf (2007) implies Hlodvir's death may have taken place earlier as his son Sigurd "may well have been an active leader since the 980s". ^ "When Thorfinn came of age he asked Earl Einar for a third of the islands". Thorfinn is said to have been five years old when his father died at the Battle of Clontarf in 1014. 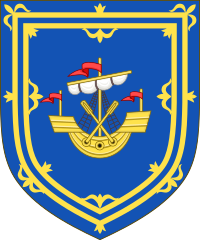 ^ Blazon: "Azure, a lymphad at anchor or flagged gules sails furled argent oars erect in saltire within a double tressure flory of the second" as shown today in the 1st quarter of the arms of Sinclair, Earl of Caithness. ^ Crawford (2013) states that there was no Earl of either Orkney or Caithness from c. 1350 to 1379 but later in the text elaborates on Erengisle Suneson's status as earl from 1353-1360. It is possible Suneson never actually visited the earldom although he continued to use the title for decades after the death of his wife prior to 1360, at which point his rights to it would have ceased. ^ Blazon. Quarterly: 1st and 4th grandquarters, Argent on a Saltire Gules a Lymphad sails furled Or a Chief Ermine (Fitz-Maurice); 2nd grandquarter, quarterly: 1st and 4th, Gules three Cinquefoils Ermine (Hamilton); 2nd, Argent a Lymphad sails furled Sable (Arran); 3rd, Argent a Heart Gules imperially crowned Or on a Chief Azure three Mullets of the first (Douglas); over all at the fess point an Escallop Or for difference (for Lord George Hamilton, 1st Earl of Orkney); 3rd grandquarter, quarterly: 1st and 4th, Gules three Lions passant guardant per pale Or and Argent (O'Brien); 2nd, Argent three Piles meeting in the point issuing from the chief Gules; 3rd, Argent a Pheon Azure. ^ a b Sturluson (1992), Chapter 99 "History Of The Earls Of Orkney". ^ Pálsson & Edwards (1981), p. 10, Chapter 5 "A poisoned tooth"
^ Thomson (2008), p. 30, quoting chapter 5 of the Orkneyinga saga. ^ Johnston, A.W. (July 1916) "Orkneyinga Saga". JSTOR/The Scottish Historical Review. Vol. 13, No. 52. p. 393. Retrieved 27 January 2014. ^ "Upper Bowertower, Stone Lud". Canmore. Retrieved 27 January 2014. ^ Muir (2005), p. 47:"Earl Brusi died in the early 1030s." ^ Debrett's Peerage & Baronetage (1968) p. 206, as shown in 1st quarter of arms of Sinclair, Earl of Caithness. ^ Moule, Thomas (1842) Heraldry of Fish: Notices of the Principal Families Bearing Fish in Their Arms London, p. 175, retrieved 14 April 2018. ^ "Kirkwall, Castle". CANMORE. Royal Commission on the Ancient and Historical Monuments of Scotland. Retrieved 1 April 2018. ^ a b c d e f g h i j k l m "Orkney, Earl of (S, 1695/6)" Cracroft's Peerage. Retrieved 1 April 2018. ^ "Peter St. John" University of Manitoba. Retrieved 1 April 2018. Larsen, Stein Ugelvik; Sulebust, Jarle (1994). I balansepunktet: Sunnmøres eldste historie (in Norwegian). Sunnmørsposten Forlag (with Studiegruppa for Sunnmøre, Universitetet i Bergen). ISBN 82-91450-00-5. Radner, Joan N. (editor and translator) (1978). "Fragmentary Annals of Ireland". CELT: Corpus of Electronic Texts. University College Cork. Retrieved 10 March 2007. Stølen, Anders (1988). "Frå Jarleætta på Sunnmøre til Blindheim-ætta og Smør-ætta". Norsk slekthistorisk tidsskrift (in Norwegian). 31: 259–277. ISSN 0029-2141. This page was last edited on 21 April 2019, at 01:40 (UTC).